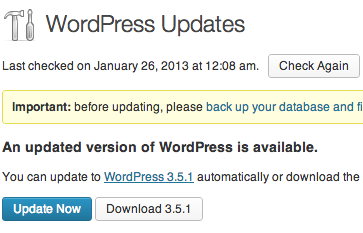 Last night, WordPress 3.5.1 was released. The first of many WordPress maintenance releases. This release of WordPress contains 37 bug fixes and 4 security related updates. Editor: Prevent certain HTML elements from being stripped or modified. Pingback vulnerability which could lead to a site being compromised, affects all previous WordPress versions. Two instances were allowing shortcodes and post content to process cross-side scripting. Windows users running IIS will need to take special note of the proper process to upgrade without issue. You can read more about WordPress 3.5.1 on the official announcement post. Not comfortable upgrading on your own? We will take care of it for you!